The 1st class Large booklet has now made an appearance in supermarkets in the south. Now on our shop here. Cylinder details: cylinder number W2 (red), W1 (phosphor), W1 iridescent. 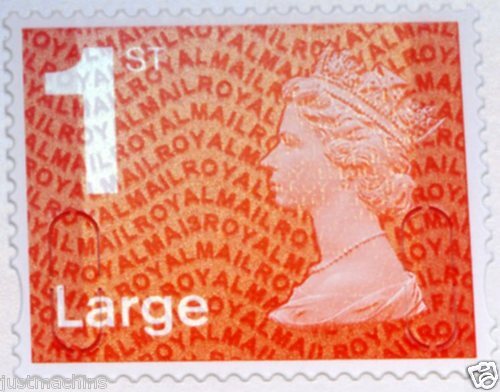 High shipping charges by Royal Mail and associated businesses to thee US is killing GB stamp collecting. I'm not sure what that has to do with the subject, perhaps you could elaborate. Actual postage for a 20g letter to the USA is £1.28, so you must expect that other businesses will charge accordingly. These charges certainly aren't killing GB stamp collecting here, or in the rest of the world. If you are in the US then you should support US dealers selling GB stamps, perhaps? Looking at the above image I notice two things. 1. the 3 in MA13 is a smaller font to the MA1. 2. the MFIL source code has been moved from top RH corner to bottom RH corner. Have I missed something here, I am not an expert in these matters? You're right with (1), that is quite small. Yes, given that it is a sans-serif typeface (like Arial) it looks the same. In the small stamps of course (until DLR changed this year) the AI in MAIL is changed to two figures. Not quite, Ian. The 2010 1st & 2nd class small Machins were MA10, as were the 50p stamps from the King's Stamps PSB, and the latest Enschede 1st class coils were MA12. Irrespective of printer, all of these - together with the MA10, MA11 & MA12 1st & 2nd class large Machins (with two exceptions), the MA10 RSF and Special Delivery issues and, of course, this year's denominated issues (though I must say that the latter are pretty indistinct)all seem to use the dual-purpose I/1 mentioned above.The exceptions are the Walsall MFIL/ and MBIL/MA12 issues, in which the 1 seems slightly wider than the I. These two also seem to have the 2 in a slightly smaller font, like John Russell's MFIL/MA13 which started all this. Oddly, the version of the 50p MPIL/MA10 from the King's Stamps PSB with small bridges on the security cuts seems to have the 0 in a smaller font, but the version with wide bridges doesn't. Nothing very startling, or even perhaps very interesting, but I'm surprised no-one seems to have noticed this before.